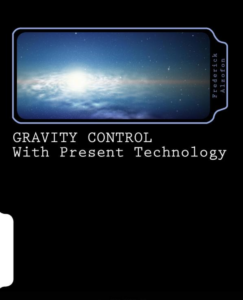 Gravity Control With Present Technology – The Holy Grail of physics, gravity control, from theory to applied technology, will be found inside this volume. The inventor was Dr. Frederick Alzofon (1919-2012), a physicist with a world-class reputation in optics and heat conduction who studied particle physics with J. Robert Oppenheimer and David Bohm, relativity and the scientific method with Victor Lenzen, and applied mathematics with Griffith C. Evans at Cal Berkeley in the 1940s and 1950s. Alzofon’s theory has the virtue of being visualizable and simple enough to communicate with some old-fashioned hand-waving and sketches on a paper napkin. You will find the “paper napkin” lecture here, as well as the advanced physics you would expect. You will also find experimental proof. The first half of the book considers the implications of the technology for humanity: the conquest of space, a total revamp of terrestrial transportation, and a second Industrial Revolution. It will also reduce the causes of global warming, while drawing the fossil-fuel industry as early adopters. Entrepreneurs and engineers should find this part of the book most appealing. The second half of the book dives into the nuts and bolts of the theory and technology. Nothing is withheld. Flash: Nothing is secret either — the technology has been around in full public view since 1981. Why mainstream science ignored it is one of the themes of the book. In contrast to other books on the topic of “antigravity,” this one delivers the goods in terms of known physical science. If you’re not a scientist or an engineer, you will not feel left out. The theme of the book is accessible to all, and it’s a popular one: hope for humanity. But here, the hope is based on a world-transforming technology. The time is ripe for a paradigm shift, and this book points the way. This volume is an update of an earlier book by the same author, How to Build a Flying Saucer (And Save the Planet), occasioned by the publication of The Top-Ten UFO Riddles. The current volume focuses on the science of gravity control, with new chapters on the scientific method and a program to research and develop the technology. The Top-Ten UFO Riddles: Solutions from Science – Something happened in December of 2017 — something so unusual it hinted at revelations on the way that will rock our world like nothing before in history. For students of UFO history, the meaning was clear: Denial is out. Disclosure is in. Starting now. Military jets have been taking gun-sight photos of UFOs for decades, but until December of 2017, these films were unacknowledged and off-limits to all but those with the highest security clearances. In the past, science has fallen flat on its face trying to solve these riddles. The only solution they’ve had has been to deny the testimony of tens of thousands of eyewitnesses, not to mention an abundance of radar screen recordings. But one American physicist, Dr. Frederick Alzofon (1919–2012), managed to crack the riddle of gravity control, which is at the heart of all the other mysteries. In “The Top-Ten UFO Riddles” you will peek under the hood of a flying saucer and find out how it works, down to the nuts and bolts. You will also learn how we can duplicate this technology, unleashing a Second Industrial Revolution, while making space travel as common as a trip to the mall. “The Top-Ten UFO Riddles” is partially derived from David Alzofon’s 2017 book, “How to Build a Flying Saucer (And Save the Planet).” Considerable new material has been added, including three new riddles: How UFOs disappear midflight, why saucers are so heavy, and how the aliens walk through walls. Also added: Seven never-before-published UFO case studies, including the author’s encounter with a black triangle the size of a 737 while driving on a lonely stretch of I-5 in California. The science behind the solutions has appeared in refereed journals and is backed by experiment. The author explains the scientific method in depth and shows how to use it as a yardstick to evaluate competing truth claims about UFOs, from astrophysicist Neil deGrasse Tyson’s assertion that only stupid aliens would build a flying saucer that spins, to whistle-blower Bob Lazar’s revelations about reverse-engineering at Area 51, to claims made for electrogravitic technology and faster-than-light travel. 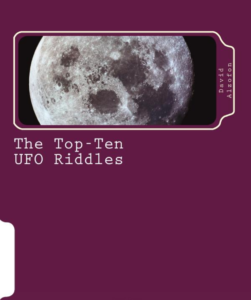 “The Top-Ten UFO Riddles” not only provides you with the top-ten solutions, it provides you with a set of skeptical scientific criteria that will keep you from being swayed by fake science or fake news in the future — when the deluge begins.